The power of information. Equipped with a remote digital LCD control unit, operators can now monitor hydraulic and compressor oil temperature, pressure, system hours and error logs, for on-the-spot analysis and troubleshooting. Work in extreme climates. Built-in freeze protection and an over-temp safety switch defend the system from severe heat and cold, extending system life. No belts to adjust or replace. More space for tools and other equipment. No need for an external hydraulic cooler if you are only installing the compressor system. Uses over-sized cooler to maintain low hydraulic temperatures. 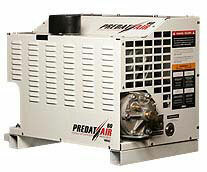 Protects the compressor from overheating. Cold start protection for the hydraulic motor and cooler. Prevents hydraulic oil from overheating. Reduces load placed on the hydraulic system during the compressor startup. Reduces air pressure when not using air but the system is on. Reduces thermal load when the compressor is not in use. Reduces fuel consumption on truck. Turns off hydraulic oil to the motor when air is not being used. Will automatically re-start when air is required. Delay is adjustable via the remote control box. No need to purchase when installing an air reservoir tank. Protects the compressor system from contamination from downstream sources. Allows use of second throttle speed. Drops truck engine back to base idle when not using air. When properly maintained, VMAC compressors should last for the service life of your vehicle. Your truck hydraulic system powers the compressor. There are no additional engines to maintain or carry additional fuel for. Again saving you time, money and energy. Easily transferable to new service truck body.